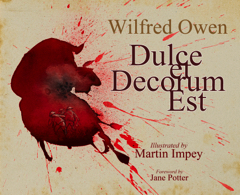 To mark the Armistice centenary of both Wilfred Owen’s death and the Armistice, illustrator Martin Impey illustrates one of the greatest war poems ever written, Wilfred Owen’s searing polemic, Dulce et Decorum Est. Impey draws on Owen’s words in a vivid and dramatic way. With a Foreword by Dr Jane Potter and acknowledged by Owen’s nephew, the late Peter Owen, the book includes Owen’s four original drafts. Impey’s powerful depiction serves to remind us, just as Owen intended, of the tragedy and futility of industrial warfare. The powerful reimagining of one of the most influential pieces of First World War poetry bring new life to Dulce et Decorum Est.